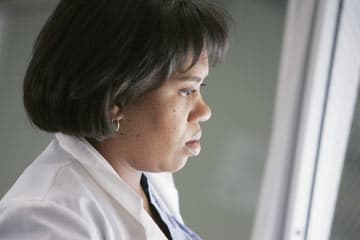 Does Dr. Bailey deserve to be monitored? McCritic: Bailey is a success due to her intense focus -- but a baby can even placate a nazi. Isn't that the tagline all storks wear around their necks before dropping newborns into the world? Until Dr. Bailey can prove she has the physician fire back at full flame, it makes sense that the good chief won't let her carry on by herself. Married-to-McDreamy: No. There is no reason for the Chief to be mommy-tracking this self-sufficient, sassy attending surgeon. She can clearly hold her own in the operating room, despite the new (little) man in her life. iheartizzie: I love the Chief. 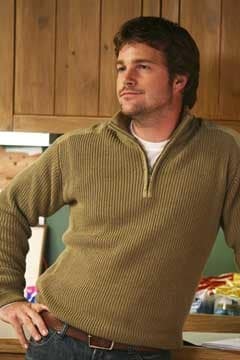 I think he's a cool guy and does a great job running the show at Seattle Grace. He's got to lay off Miranda here, however. If memory serves, she was performing surgery while very pregnant, her unborn son kicking up a storm in the womb. That was okay, but she gets mommy-tracked now? Come on, Chief. How about cutting one of your top surgeons a little slack? On a side note, I can't believe I just said "womb." Gross. What's the proper punishment for Alex? iheartizzie: Izzie's Scrabble showdowns with Denny can get pretty heated. I think they need a full-time referee to sit there and monitor their witty wordplay / sexual innuendo. One whose mouth must be duct-taped shut. McCritic: Being locked in a basement and forced to listen to Ashlee Simpson songs on repeat all night. 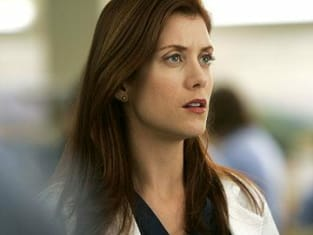 Married-to-McDreamy: I think the punishment dished out by Addison -- forcing him to continue assisting her in her surgeries -- is sufficient enough. The look on his pompous face when she told him that was pretty priceless. He needs to be faced with some gory gynecological procedures and perhaps then he'll realize that he should shut his mouth and start treating the ladies around there with a little more respect. Birthing a horse: total turn-on or dating disaster? Married-to-McDreamy: Total turn-on... for Meredith, that is. If it were me, I would have turned around and run out the door. Horses scare me. McCritic: If there's no mounting or riding involved, as well as a severe lack of riding crops, I don't see why this would be a turn-on. iheartizzie: While it was a bit unconventional, Meredith's first date with Finn could have been a lot worse than the emotional force of birthing a horse, of course. Who has better odds of lasting until Season Three: Denny or Alex? iheartizzie: i Scribed back in March that Alex was a strong candidate for departure from SGH. Now it's looking even more likely. Being a pompous jerk is one thing. Going out of your way to get Addison and the hospital sued is quite another. Married-to-McDreamy: Denny, for sure. This guy is not going anywhere. Alex, on the other hand, may be pushed over that nice glass balcony outside of the Chief's office any day now. McCritic: Denny stands at 4:1. The savvy Scrabbler may not even need a new heart soon -- his current one beats anew to the beauty, love and affection of Izzie. It's been restored, sans modern medicine, with contemporary cuteness. Alex, however, may go off at 7:5. He's blown his chance with the lovely doctor, blown his lid at every superior and seemingly blown his load... of possible story lines in which he can be used.